Here you will find Quick Start Guides, user manuals and further detailed information on current hardware and software products from Vicon. If you have an urgent problem with your hardware or software, our Support Team is ready to help. The next available staff member will assist you as soon as possible. If you observe that the quality of your data has decreased over time, the reason is very often that markers are dirty or damaged. If you wish to replace them, we have stocked a large selection of markers in different sizes, ready for shipment. Furthermore, we also have double-sided tape, retro-reflective marker tape, rigid bodies and motion capture suits. Please download a full list from the Downloads section. In case you have technical questions relating to your measurement system, or you wish to know more about the possibilities for upgrading, expanding or installing a brand new measurement system, we are happy to advise you on the different available options, including synchronization and interfaces with 3rd party devices and software. Support is a key element of what prophysics offers, which is why we have a large team ready to assist you. Most users have a support contract that gets renewed every year. If you do not have a contract, we are also able to bill you hourly. What workshops and training courses does prophysics offer? We offer both in-house and on-site courses and workshops at beginner and advanced levels. Furthermore, we are also able to offer professional services such as help with biomechanical models, integration of 3rd party devices and even software customization. Please contact us for availability and prices. 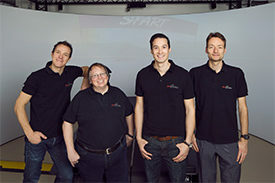 Our expert support team has years of experience in setting up and optimizing motion measurement systems, as well as in training users to efficiently use them. We offer everything from planning and advice for designing and building laboratories and studios, through installation and training, to assistance with repairs, questions and other support issues throughout the lifetime of the motion measurement system. 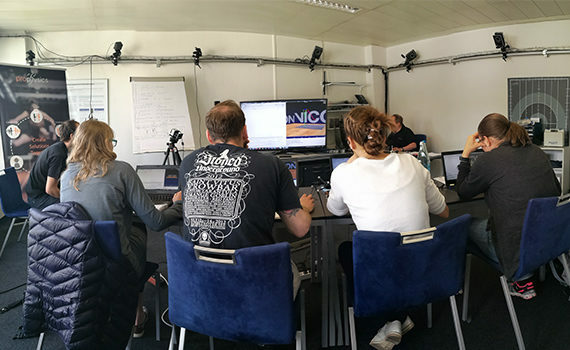 We offer training courses both for beginner and advanced Vicon users at our location in Zurich. Here, the participants will learn the important aspects of Vicon hardware and software during two days, which is enough time to cover both the general functionality as well as to go into the specifics that will help users get the most out of their systems on a day-to-day basis. We are also pleased to offer customized training courses, which take place either at your own location or in our offices in Zurich. These courses are ideal if you have specific needs or wishes that relate directly to the challenges you need to solve at your facility – by letting us help you, you are likely to achieve your goals faster. Using AnyDesk, an online application which allows us to share a PC desktop with you, we are able to offer training courses and support remotely. This is especially useful when addressing questions that relate directly to the software, for example how system settings and workflow can be optimized. Using TeamViewer, an online application which allows us to share a PC desktop with you, we are able to offer training courses and support remotely. This is especially useful when addressing questions that relate directly to the software, for example how system settings and workflow can be optimized. A customized biomechanical model allows you to calculate the exact results you want – and a customized report will show the results in the way you want them to be communicated. If you need help with this, we have years of experience and expertise which you can tap into in order to quickly get you moving. Vicon – which types of cameras are compatible with each other? The current generation of Vicon cameras – Vantage, Vero and Vue – are all compatible with the previous generation, the T-Series and Bonita. Note that an upgrade of the Nexus, Tracker or Blade software may be required to ensure full compatibility. Vicon – which camera types can measure outside in sunlight? All the Vicon Vantage cameras (V5, V8 and V16) have built-in filters that are designed to filter out the unwanted light from the sun – ensuring that you can take the cameras outside even on a sunny day. Vicon – what are the recommended PC specifications? Zebris – what are the recommended PC specifications? Contemplas – how to integrate the supported cameras? installation instructions for the network card! Vicon – how can external devices be combined with the Vicon System? DThe hardware from 3rd party providers (EMG, EEG, force plates) that have analogue output can be directly connected to the analogue input ports in the Vicon Lock+. If no analogue output exists, or if a digital integration is preferred, the Vicon Nexus software can also integrate directly with several digitally connected devices, for example from myon, AMTI, Kistler and Ergoneers. Please contact us for more details.